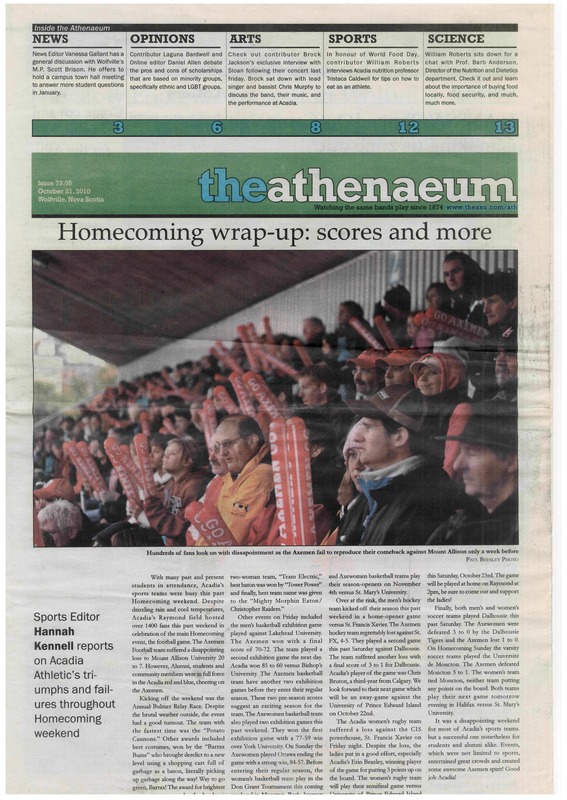 While completing my degree at Acadia University, I had the opportunity to work as Sports Editor for the school’s student newspaper, The Athenaeum. 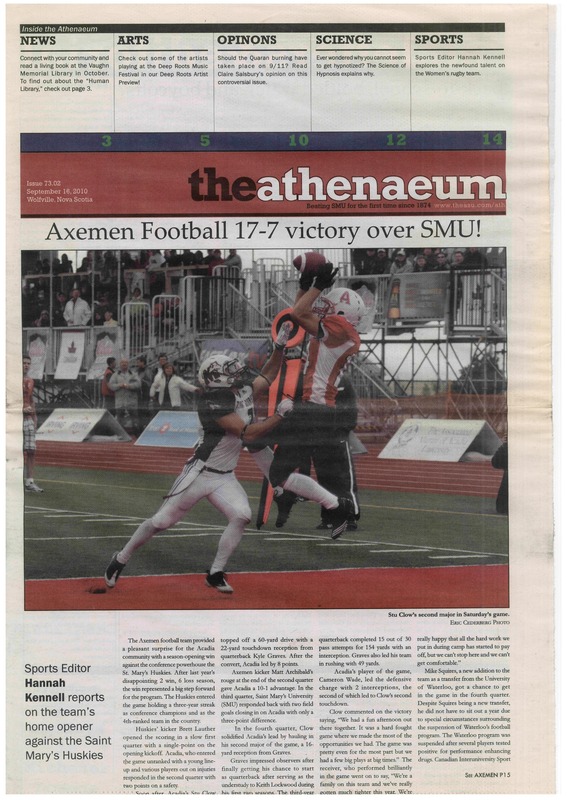 I gained in-depth experience producing news articles covering many sports-related issues. 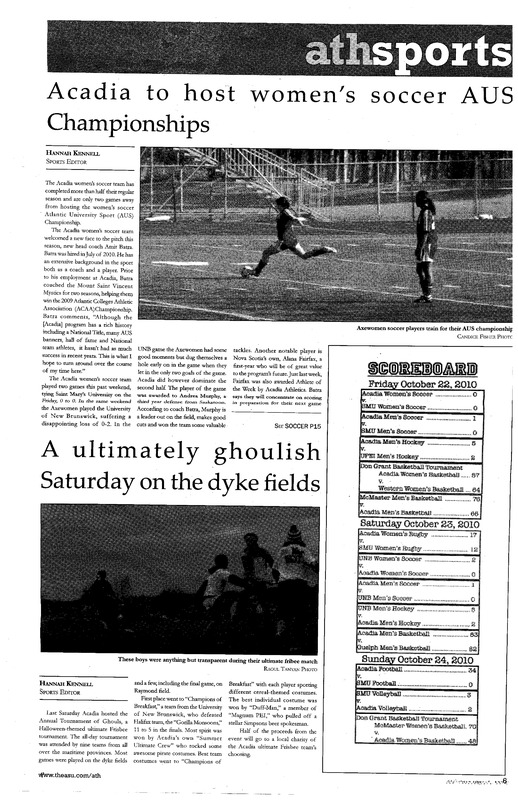 As Sports Editor, I contributed weekly articles to the section, collaborated with staff to generate story ideas, assisted reporters in writing and improving their work, and was responsible for the lay-out (InDesign) and final editing of the weekly sports section. 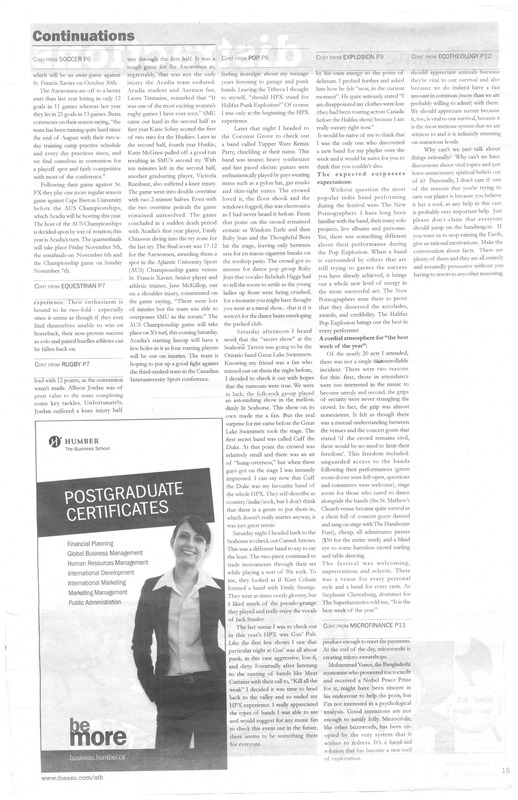 The position gave me the opportunity to refine my writing skills in an academic setting. 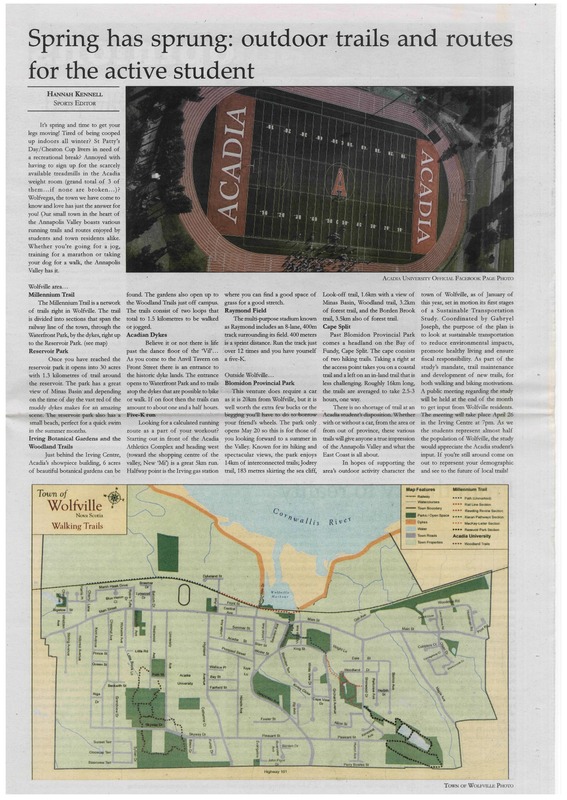 I wrote about all things sport and lifestyle; from local running trails and football headlines, to fundraising initiatives and campus traditions. 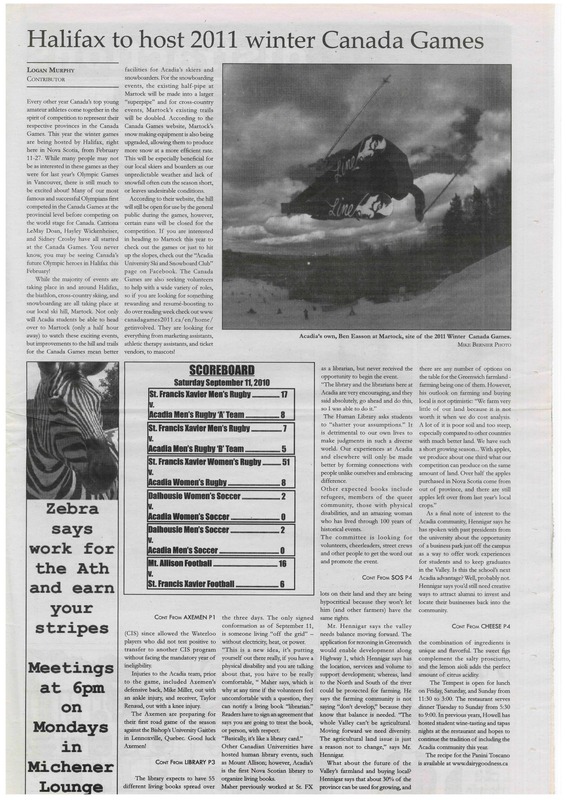 The following is a compilation of articles I wrote, edited, and laid out while working for the publication. 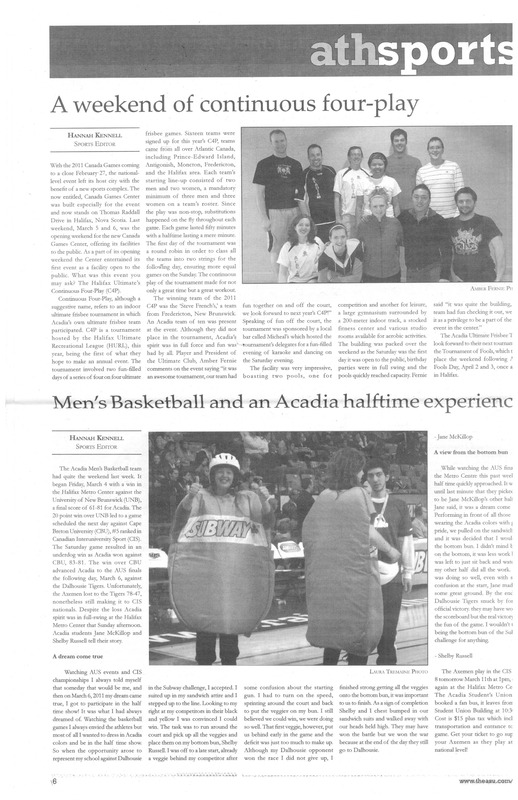 The Atheneaum, Issue 73-18 (April 7 2011) - "Spring has sprung: outdoor trails and routes for the active student"
The Atheneaum, Issue 73-15 (Mar 10 2011) - "A weekend of continuous four-play" and "Men's Basketball and an Acadia halftime experience"
The Atheneaum, Issue 73-8 (Nov 18 2010) - "Curtain comes down on the football field"
The Atheneaum, Issue 73-6 (Oct 28 2010) - "Acadia to host women's soccer AUS Championships" and "A ultimately ghoulish Saturday on the dyke fields"
The Atheneaum, Issue 73-05 (Oct 21 2010) - "Homecoming wrap-up: scores and more"
The Atheneaum, Issue 73-4 (Oct 7 2010) - "An Acadia tradition: the annual Bulmer Race"
The Atheneaum, Issue 73-02 (Sept 16 2010) - "Axemen Football 17-7 victory over SMU!" 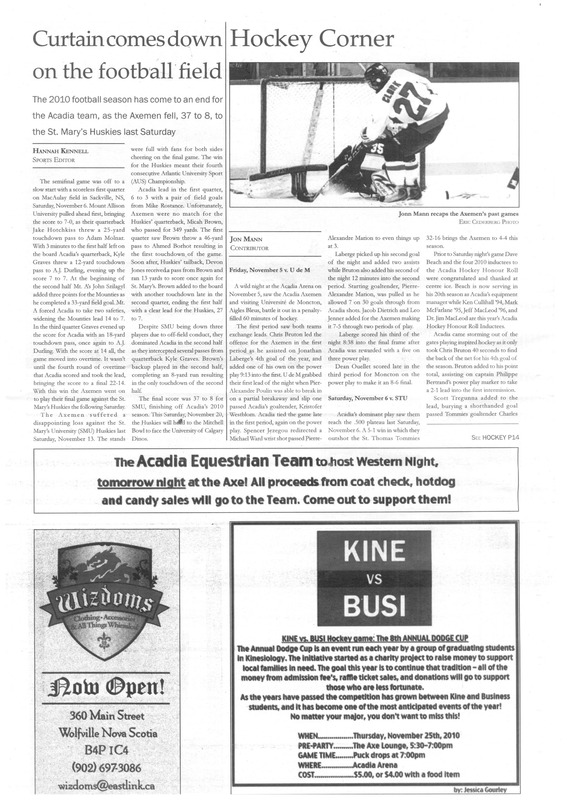 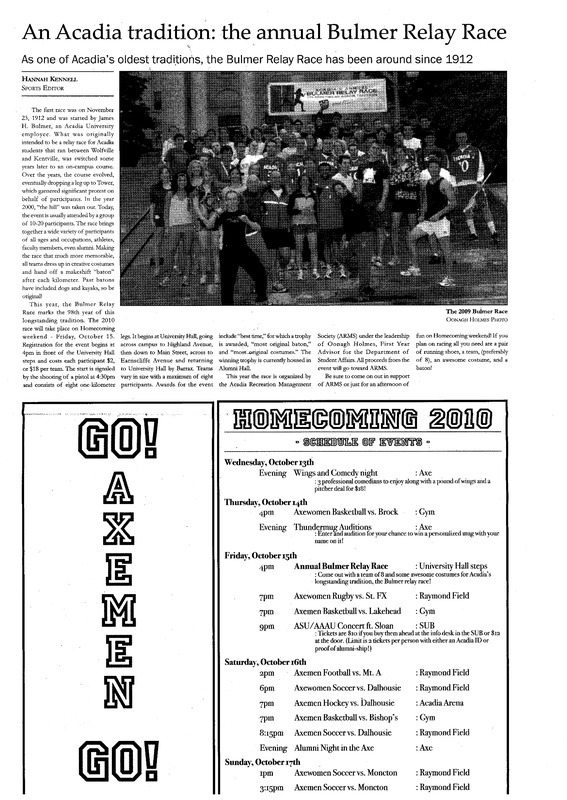 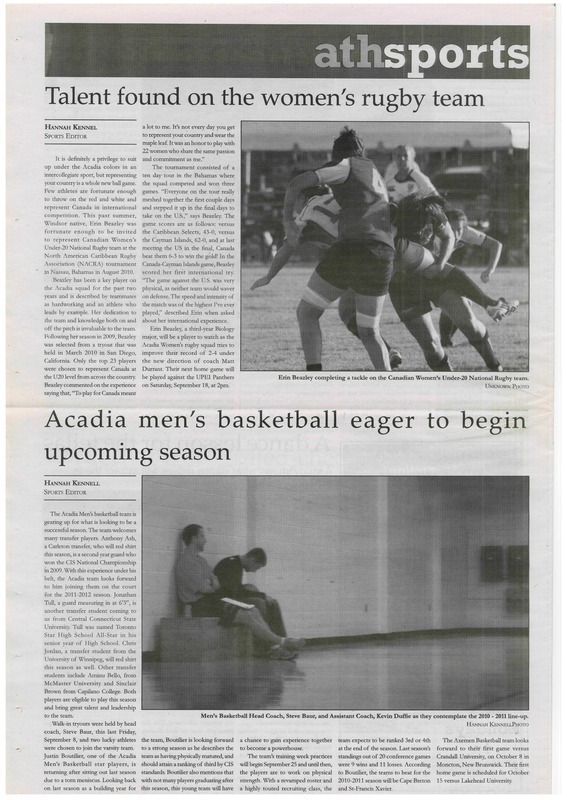 The Atheneaum, Issue 73-02 (Sept 16 2010) - "Talent found on the women's rugby team" and "Acadia men's basketball eager to begin upcoming season"